Hey everypony! We've got a treat for you. An upcoming fan-made visual novel is in the works starring the pony mascots Rising Star and Heartland. Both characters are representatives of Brony Fan Fair, an upcoming convention in Austin, TX on September 13th-15th at the Holiday Inn Austin Midtown. Lights in the Sky is the story of Rising Star’s journey to find her cutie mark. As a farm filly, Rising Star tries hard to fulfill the responsibilities given to her by her older sister, Heartland. But an opportunity arises where she finds that her heart’s desire may rest outside the boundaries of the Star Fields family farm. Rising Star will be put to the test as she is forced to decide between adherence to her sister’s wishes or the yearning to follow her own dreams. The first part of the novel will be available on June 25th, 2013 on the Brony Fan Fair website. Players will be able to play Rising Star’s exploration of the Manehatten Astronomical Society building, the first leg of her journey. 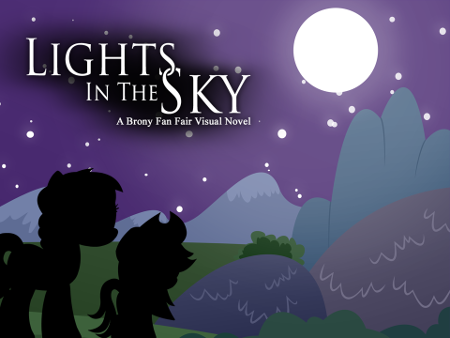 Lights in the Sky is a short-and-sweet creation of Peter Jiang, Chairman for Brony Fan Fair. The visual novel was a final project for the "Writing and Narration for Video Games" spring semester class at the University of Texas at Austin taught by Sheldon Pacotti (writer on Deus Ex) and is being developed for younger audiences. Pacotti comments: "...[A]s a work of interactive fiction -- from what I've seen -- it succeeds on every level. There is conflict, exploration, a sense of adventure, and the writing always stays safely in the established My Little Pony universe."